As we begin 2017 we are humbled by the successes of the last year. From launching 4 new products, to hosting several major industry events and most notably, celebrating our 50th Anniversary, 2016 was truly an unforgettable year at Dorner. We would like to express our appreciation to our valued customers, channel partners and associates. We sincerely thank you for your business and for growing with us. 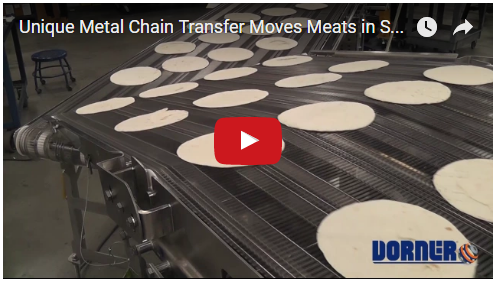 For a recent application, a customer needed to move cooked foods between machines, but needed to address issues such as product temperature, sanitary requirements and maintaining product orientation. The customer was moving cooked sausage patties and sausage links from the oven and delivering them to a spiral freezer unit. A stainless steel wire belt was used for this application due to the need for the belt to withstand the high temperatures of the product coming out of the oven. Dorner has added Enrico Berlenghi to our management team as Managing Director â€“ European Sales. In this new position, Berlenghi will be focused on sales development for all three Dorner Holding Companies: Dorner, FlexMove, and Geppert-Band. Prior to joining Dorner, Berlenghi held various sales and marketing business director positions at Span Tech Europe, Kuhn Holding, and D&D. Geppert-Band, a Dorner Holding Company, and leading European manufacturer of belt and modular belt conveyors, has added Sven Fitschen to its management team. Fitschen has been appointed Managing Director of Operations. Fitschen replaces long time President Thomas Blesinger who retired in November. Fitschen brings a strong European operations and material handling background to Geppert-Band, having previously worked at DB Santaslao Gears and Getriebebau.